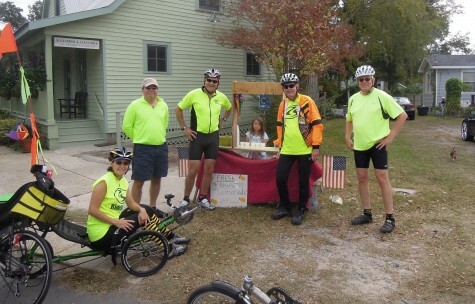 One of the many highlights of the Mississippi Coast Ride yesterday was Chelsea’s lemonade stand in Waveland. She managed a smile when posing for us, as we enjoyed her delicious, fresh-squeezed lemonade from some fine lemons she had on her table. Of course, our herd of trikes, and bike, were a bit overwhelming for the cute seven year girl. Her dad even came out and asked if she needed help. She didn’t. Captain Johnny and Beth put on an awesome tour of Bay Saint Louis, Waveland, and Pass Christian on a gorgeous Sunday! The Captain guided us through downtown areas, residential sites and scenic waterfront vistas. We zigzagged past, now empty lots, overgrown with grass. We also passed new homes, bright and colorful . . . the contrast indicative of the horrific storm devastation, and the powerful will of the affected land owners. Later, dining outside at the Buttercup Cafe was delightful and entertaining. After a great lunch, we crossed over the Bay Bridge on a fantastic, dedicated bike lane, totally isolated from traffic, which allowed us to pause and enjoy the shimmering water view eighty feet below! There was plenty to see on both sides of the bay. Gregg showed us where he grew up and we all enjoyed seeing the schools and haunts of his youth. We were reminded of the tragedy as we walked through his Mom’s abandoned house that was flooded in the storm. The loss and suffering that still lingers in this area is unimaginable. But now there appears a more powerful aura in these communities . . . resolve! Everyone we met thanked us for being there and asked us to come back again with more folks! The friendliness was contagious! Throughout the 50 miles we traveled from about 9-4, we only encountered friendly drivers everywhere along the all new and smoothly paved roads. Trikes are the ideal vehicle for touring the roads, piers and trails in this area! They are quick, manuverable, safe and fun! The drive down to the coast was pleasant and well worth the trip. The Knight’s Inn was perfectly located and breakfast at The Waffle house was energizing. A perfect tour! But the most impressive lesson was highlighted by Chelsea, and her lemonade stand, as she doggedly stood by . . . waiting. We hope you will plan to sample the sweetness of the Mississippi coast soon and support the monumental regrowth of an area that has been handed more than its share of lemons.